Apple just announced new versions for the iPad and Apple TV. 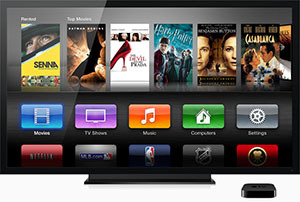 The “iPad 3” (unofficial name, officially it is called “the new iPad”) was highly anticipated for a while now, but the announcement of a new Apple TV came as a bit of a (welcome) surprise. The most welcome update of the new iPad would certainly be the improved resolution of 2048x1536 pixels, great for showing off your photos to others! The support of full HD on the apple TV, will be welcomed by many too.